Crystal clear polystyrene containers for beads, semi precious stones, and buttons. Polystyrene containers are an excellent choice for the packaging beads, semi precious stones and buttons. The straight wall of these containers is perfect for applying foil labels or transparent decals. 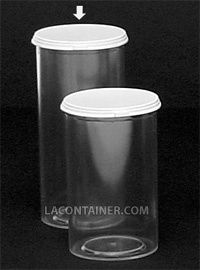 These containers are crystal clear with a high gloss finish and a white polyethylene cap. Great for items that need to be seen to be appreciated. Crystal Clear Polystyrene Vials with Polyethylene Snap-Cap. Note: Vials are shipped with caps attached unless you request uncapped vials. 47.6mm Dia. X 108.0mm Ht. 1 7/8" Dia. X 4 1/4" Ht.